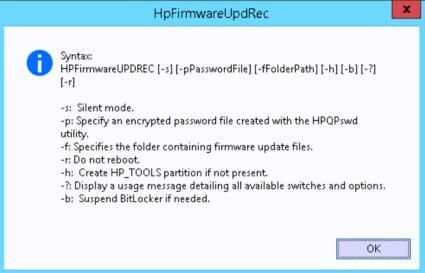 In this post, we will show hot to update HP BIOS using the latest HPFirmwareUpdRec tool within a task sequence. 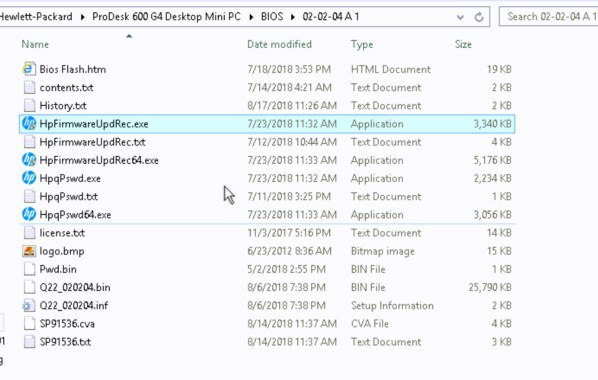 When downloading the bits from HP, looking at the BIOS files you need to see HPFirmwareUpdRec.exe. 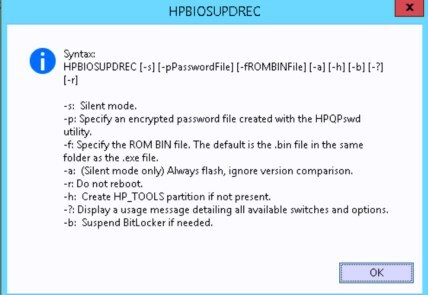 If the file is not there, the update should be done using the old tool HPBIOSUPDREC.exe like before. If we look closely, the -F as changed from specifying the ROM Bin file, to specify the folder containing the firmware update files. After multiple testing, turns out that we can just skip the -F option and the tool will find the .BIN file within the source folder and use it. The -b option turned out to be necessary even if BitLocker was not enabled yet as part of the task sequence. So the Run Command Line set should look like this. the package used is pointing to the root of the folder where the tool and the .BIN file are located. Note that the previous password.bin file worked just fine. But that was not the end to surprises. 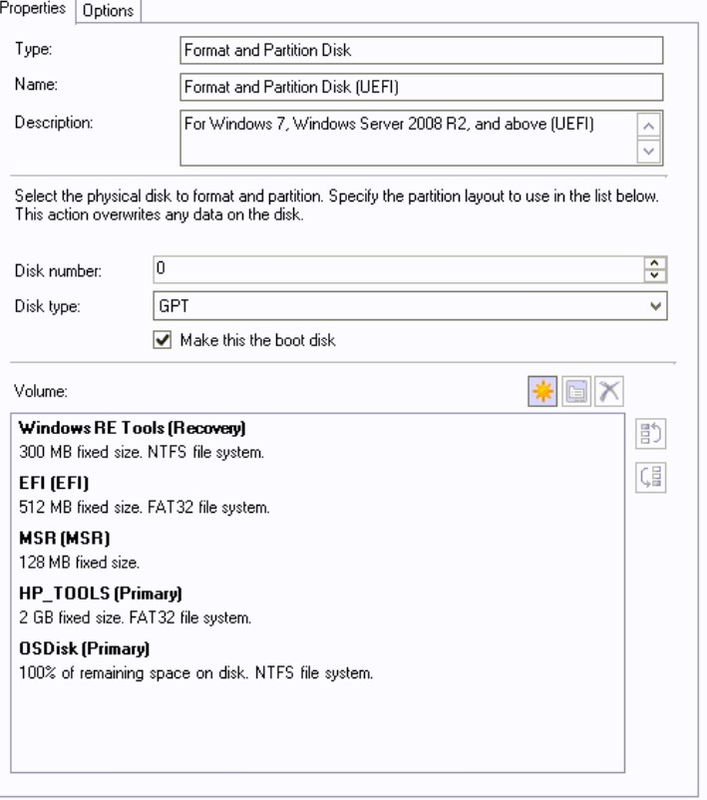 On the new models, HP provides by default an HP_TOOLS partition of 2GB. Turns out that the HPFirmwareUpgRec is using that partition to update the BIOS. No need to assign a letter for that drive, but the name is important. Once this was added the update went well! Hurray!! Retrying the task sequence over the same computer brought up another error for the BIOS upgrade. Return Code was 282. 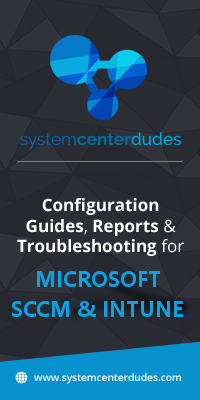 Manually running the command line from within windows led me to better understand the error. Under the run path of HPFirmwareUpgRec, it will automatically create a log file with the same name. This log provided the details about the error code 282, which simply state Same Firmware version no need to update! This is the log file I used to figure out the previous steps. So we would like to consider the 282 error code as a success code. On the Options tab the run command line, simply add 282 to the list of Success codes! Thanks for posting this. This was extremely helpful! I am running into a problem where the -pPWD.bin switch isn’t working. I get a BIOS password prompt on reboot after running the command. The update does apply successfully if I manually enter the password. PWD.bin is in the same directory as HpFirmwareUpdRec.exe. The currentbiossetuppwd.bin is generated when running HP Image Assistant in normal mode. I haven’t touched driver packs for almost a year now. The only issue is it doesn’t like to run under the SYSTEM account in 1809… yet. Was there a resolution for the 3010 error code? The machine i have is rebooting (as expected with the code) but the Firmware update is not happening. My update comes back with error code 3010 but doesn’t do anything on restart. Have you come across this before? nope haven’t seen that behavior… Try to run the same command from within Windows and look at the log file. you might see more details. Thank you for the documentation its very helpful considering HP has nothing! that is correct, I do it after the OS. Try to open the log with the command prompt in PE to see what mean error 260. Please share the result, and I’ll add it to the list of codes in the post. So what I did was, we partition legacy to UEFI first then apply BIOS setting and then partiton UEFI and apply operating system , normally this was working until this new firmware update. 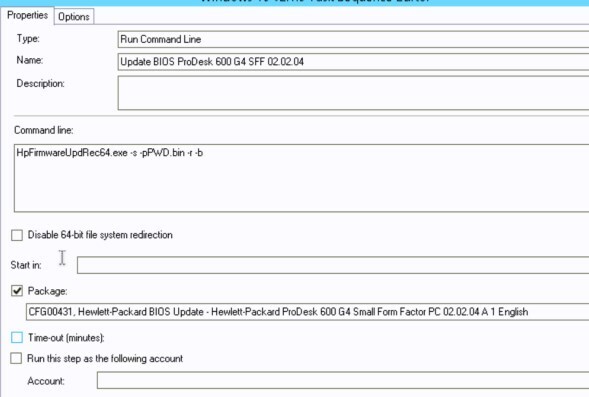 HPBiosUpdate::Partition::FindEspPartition|No GPT hard drive found. HPBiosUpdate::Partition::FindEspPartition|ESP partition found: index=0 PartitionNumber=0. HPBiosUpdate::Partition::AccessEspPartition|ESP drive already mounted as S:\. |CHPBiosUpdateApp::PrepareEfiFlash|No BIOS recovery partition was found. I kept the UEFI partition , but moved my flash step after apply OS then it works. Looks like HP wants to run all its flash in OS now. we had similar issues with TPM flashing too. Cheers the txt method fixed that part now it doesn’t continue on reboot :S I’m sure I’ll get there! Thanks for the guide. 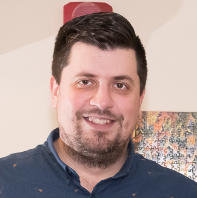 Would it be possible to put up a picture of your Disk Partition and Format step? I take it your using UEFI. For some reason mine setup doesn’t find the HP_TOOLS partition. done 🙂 added the screenshot.